Apprentice plumber Dylan Di Martino. With a long and proud history of vocational education and training, Victoria University Polytechnic offers an expansive range of apprenticeship, pre-apprenticeship and traineeship programs. These sought after courses provide foundation and generic skills, along with the practical hands-on experience valued by employers. Whether you want to become a bricklayer, a business owner or an engineer, we make it easier for you to achieve your goal. Our apprenticeship programs support the growth of the industry, which is critical to our economy and employment within the community. Flexible training is delivered to help existing employees upskill or reskill and meet the challenging needs of industry. Victoria University Polytechnic apprentices work to the highest industry standards, with some recognised for their achievements. 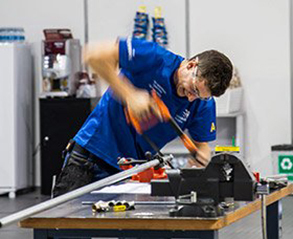 In 2015 Daniela Lopez-Granada was named Female Apprentice of the Year and apprentice plumber Dylan Di Martino won silver at the Oceania WorldSkills competition. Thinking of joining a trade but not quite sure if you’ll like it? Give yourself a great head start for an apprenticeship with Victoria University Polytechnic's pre-apprenticeship program. Pre-apprenticeships give you the opportunity to gain a realistic expectation of the work involved in a particular trade and develop important basic trade skills. You get off-the-job training as well as practical experience. Employers prefer applicants that have undertaken a pre-apprenticeship when considering an apprentice. Victoria Polytechnic offers full time pre-apprenticeships for students who wish to leave school and continue into further education. If you are considering a pre-apprenticeship, we encourage you to come and tour our trades facilities. This is a great opportunity to ask questions about the course, find out what to expect at Victoria University Polytechnic and meet some of your future teachers. When you're ready to apply please see the how to apply information located on the course page. Each trade has a different delivery timetable. Depending on the course, students will generally be required to attend classes three to four days per week for 12 to 16 weeks. - employers often prefer to take on apprentices with pre-apprenticeship qualifications. Your employer will need to contact an Australian Apprenticeship Centre and sign a training contract to register you as an apprentice. Nominate Victoria University as your preferred registered training organisation (RTO). Within six to eight weeks after successfully completing this process your classroom training will commence. Except for the plumbing and eletrotechnology certificates, these courses can all be undertaken as a standard qualification (not as an apprenticeship). Please note that employers may prefer you to have the hands-on experience of an apprenticeship, in which case finding work may be more difficult if you choose classroom-only training. We recommend that you check with potential employers before applying. 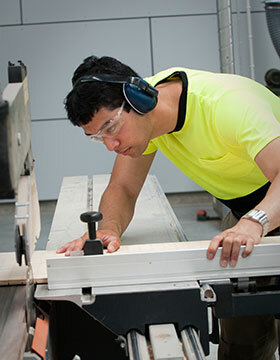 Victoria University Polytechnic also delivers carpentry and cabinet making courses at the Geelong Industry Trade Training Centre (GITTC). Apprentices have access to industry standard workshops, specialist machinery and theory rooms at the facility. 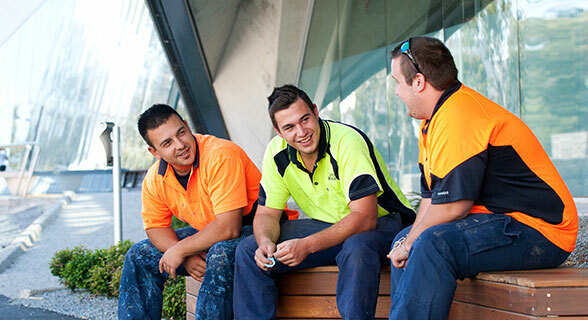 Traineeships are undertaken as on-the-job training. Your employer will need to contact an Australian Apprenticeship Centre and sign a training contract to register you as a trainee. These courses are also available to study as a standard qualification instead of a traineeship if you'd prefer. But please keep in mind that employers may prefer you to have the hands-on experience of a traineeship, in which case finding work may be more difficult if you choose classroom-only training. We recommend that you check with potential employers before applying. Find out how much your course will cost, including whether or not you need to pay material or amenities fees. For details on how to pay your fees, login to MyVU to view your Statement of Account (Tax Invoice). You must be an enrolled student to access MyVU. You may be able to complete your qualification sooner through formal recognition of your existing skills. This is known as Recognition of Prior Learning (RPL). To receive RPL, we assess your previous work, education and life experiences against recognised qualifications. Applications for RPL can be made prior to enrolling. Call us on 1300 82 33 87 to discuss RPL options with the course manager.